The PXW-Z90 offers broadcast quality 4K with advanced features such as high-speed Auto Focus, Instant HDR Workflow, up to 960fps* Super slow motion and streaming at 2.4GHz or 5GHz** with QoS. * 960 fps (NTSC). 1000 fps (PAL). ** 5GHz support dependent on support from country / regional regulation. The PXW-Z90 incorporates an advanced Fast Hybrid AF system, alongside face detection and lock-on auto focus technology, making it easy to focus and track a subject while filming. The PXW-Z90 is the first professional palm-sized camcorder to deliver stunning 4K High Dynamic Range (HDR) content with Hybrid Log-Gamma (HLG) file-based workflows. S-Log3 is also supported, enabling you to create beautiful imagery with a wide colour gamut and colour range. High Frame Rate shots can turn everyday actions into slow motion ballet and the PXW-Z90 delivers a stunning 120 frames per second (fps) in Full HD XAVC 10bit 4:2:2, giving you continuous 5 times slow motion expression. Higher frame rates up to 960fps using S&Q motion cache recording are also possible for even greater creative flexibility. The camcorder features a broadcast standard 3G-SDI output (supporting 1080 60p/50p), a Multi-Interface (MI) Shoe, HDMI and Remote interface to connect with and control remotely a wide variety of compatible Sony accessories, including creating a simple live solution when connected to the optional MCX-500 Multi Camera Live Producer and RM-30BP Remote Commander. To deliver imaging performance previously impossible for a compact camcorder. A large 14.2-megapixel (effective) 1.0-type stacked CMOS image sensor delivers beautiful background bokeh defocus effects and superior sensitivity for capturing high-quality images with less noise, even under dark or bright conditions. This sensor integrates up to 273 phase-detection AF points that densely cover approx. 84% of the image area, for precise tracking of subjects throughout the shooting frame. The sensor also gives you low noise and less blur because more light reaches the sensor, offering clear and steady pictures even in a dark scene with minimum illumination 1.7 lux*. Enhanced Fast Hybrid auto focus (AF) is comprised of a number of features: Phase-detection AF with up to 273 reference points covering approximately 84% of the image area, face detection and lock-on auto focus technology to estimate subject movement. They all work together seamlessly to capture fast-moving subjects with amazing sharpness. Shoot, edit and view HDR content in HLG without the need for additional colour grading. As the expanding need for HDR content continues, internet video platforms and professionals producing corporate or event content are paying more attention to the added value of HDR. They need to deliver content quickly, without compromising on imaging expression and quality of content. To meet this demand, the PXW-Z90 offers Hybrid Log-Gamma (HLG) recording, in addition to S-Log3, for easy file-based workflows, whilst achieving the image quality of HDR. This simple workflow enables the shooting, editing and viewing of HDR content in HLG, without devoting a lot of time to post-production work and additional color grading. High Frame Rate shots can turn everyday actions into slow motion ballet and the PXW-Z90 delivers up to 120 frames* per second (fps) in Full HD, giving you a maximum of 5 times slow motion expression. There’s no sacrifice in bit depth and no “windowing” of the sensor. So there’s no crop factor, no loss in angle of view. Higher frame rates of 240, 480 and 960 fps are also possible at specific resolutions. The PXW-Z90 allows you to record a wide range of 4K (QFHD) and HD formats for maximum flexibility from this stunning palm-sized camcorder. The Z90 supports XAVC QFHD 100Mbps recordings at 30p/25p/24p, XAVC HD Long GOP 422 50Mbps, MPEGHD422 50Mbps*, MPEGHD420 35Mbps and AVCHD. * MPEG HD recording requires optional licence (CBKZ-SLMP) upgrade. * 5GHz support dependent on country/regional regulation. Ustream® Direct Streaming allows you to share scenes as they happen with high quality picture and sound without a switcher. QoS Streaming to XDCAM air allows images to be streamed live from the camcorder for viewing at a remote location. FTP Transfer allows content files recorded with MPEG HD 422/420 proxy feature (CBKZ-SLMP required) and other content files shot in XAVC (QFHD/FHD) and AVCHD formats to be sent over the internet for remote storage on an FTP server. XDCAM air can upload proxy footage to the cloud from multiple camera operators in the field, so editing can start immediately. Uploaded content can be accessed securely from any location. News teams can even start logging clips while shooting’s still going on, saving even more valuable time when a story’s breaking. * The Content Browser Mobile™ application can be downloaded from the Google Play Store or App Store. Wi-Fi operation cannot be guaranteed with all smartphones and tablet computers. Wired LAN connection allows the PXW-Z90 to be connected to the internet over a wired connection via the separately available VMC-UAM2 USB adapter cable and network adaptor kit (CBK-NA1), allowing files to be streamed or transferred by FTP. The PXW-Z90 offers numerous connections to suit the broadcast workflow, including 3G HD-SDI, HDMI®, Multi/Micro USB jack and composite output. The Rec Trigger signal can be sent through SDI and HDMI to link an external recording device. HDMI/SDI/composite output is possible during QFHD recording*. * HDMI supports up QFHD resolution, 3G-SDI supports up to HD resolution. Composite is SD-only. The PXW-Z90 is designed to work seamlessly with Sony’s MCX-500 Multi Camera Live Producer, a robust and cost-effective switcher that makes it easy for one person to run a multi-camera live event shoot. When used with the MCX-500 and Remote Commander RM-30BP, a Tally indicator will automatically appear on each PXW-Z90’s LCD panel and viewfinder – a red icon indicates when the shot is live (PGM) while Green indicates preview mode (PVW). The MCX-500 supports up to 9 video inputs, 5 channel stereo inputs including XLR with both internal recording and live streaming via Ustream™, Facebook Live, and Youtube Live*. The PXW-Z90 is supplied with a fixed 29mm wide-angle ZEISS Vario-Sonnar T* lens, ideal for capturing panoramic landscapes. The 12x optical zoom can be increased to 18x with Clear Image Zoom, maintaining QFHD resolution using Super Resolution Technology or 24x in HD. In addition, the Digital Extender can double this range again, up to 48x zoom. The camcorder’s lens ring enables smooth, natural adjustment of focusing or zooming, depending on which mode is selected; while the manual dial and buttons on the side of the body allow swift and easy adjustment of IRIS (aperture), ISO/GAIN and shutter speed. You have superb monitoring options with the Z90: an enhanced 0.39-type 2359K dot OLED viewfinder and 3.5-type 1550K dot LCD. The super high resolution OLED viewfinder offers excellent quality brightness, contrast and response, giving you better precision of manual focus operations and eliminating any colour-breaking phenomenon. The LCD gives you further flexible composition options. The Z90 has two XLR connecters – so even if you remove the handle with its standard, easy-access XLR connector then a second on the body is still available, making it ideal for applications such as shooting in a confined space, such as a car interior, or when mounting on a gimbal. 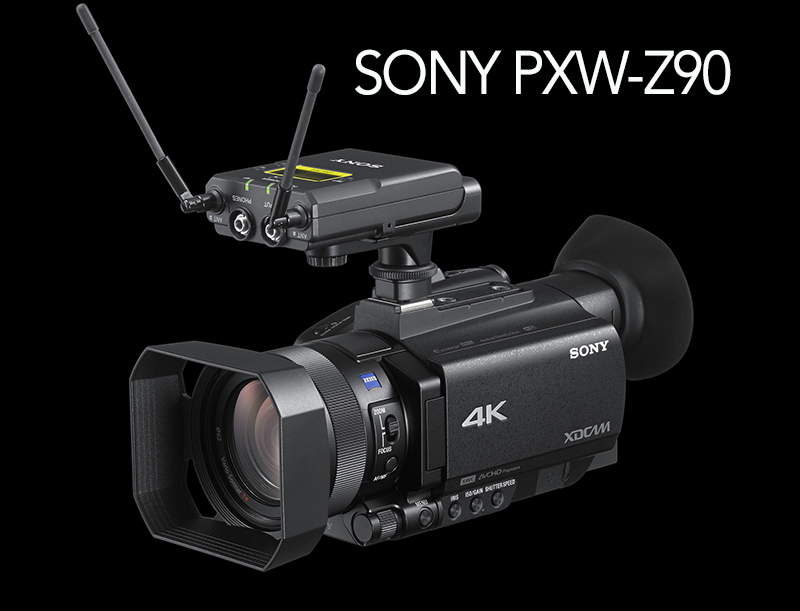 The PXW-Z90 takes advantage of Sony’s flexible Multi-Interface (MI) Shoe, which provides power, signal connections and coordinated on/off switching to compatible Sony accessories. For example, you can connect and control Sony UWP-D wireless microphone systems (sold separately). To extend recording time and workflow flexibility, the PXW-Z90 is equipped with two memory card slots and is compatible with SDXC and SDHC cards as well as Memory Stick PRO Duo (Mark 2) / PRO-HG Duo*. Relay mode automatically switches recording from the first to the second memory card when the first is full; Simul mode allows simultaneous recording to two memory cards (for example to create an immediate back-up version). The PXW-Z90’s two Start/Stop buttons on the handle grip and camcorder body can independently start and stop recording on different memory cards while recording in Simul mode. We have an X70 that is a versatile unit that delivers well. This looks like a good upgrade – especially on the fps front. Just out of interest though – what is the name of that wireless unit attached to the top in the picture? Has it been around a while or is that also new tech that Sony has just launched? Simon – 4:2:2 was considered highly desirable in the days of interlace TV systems, but the rationale is nowhere near as valid for progressive. And since all 4K is progressive, 4:2:0 subsampling is indeed considered fully broadcast acceptable for such. Yes, there may be reasons for better than 4:2:0 colour resolution for certain types of work, but it’s only likely to be relevant for very high end work. And far better then to keep the symmetry and move to 4:4:4. For a given bitrate, 4:2:2 means higher compression than 4:2:0 (all else equal) – hence if bitrate must be limited (to use SD cards, possibly) it can actually be better overall to have 4:2:0 and less compression. The description above, pasted below says that there is second xlr connection on the body, Where? HDW : I think they mean the following…The PXW-Z90 takes advantage of Sony’s flexible Multi-Interface (MI) Shoe, which provides power, signal connections and coordinated on/off switching to compatible Sony accessories. For example, you can connect and control Sony UWP-D wireless microphone systems (sold separately).